The world is now getting increasingly polarized . I am not implying from the religious beliefs, tolerance , lack of patience or other similar trending subjects. Some believe that that the generation gap has only got much wider now with each generation and its predecessor. I am talking about polarization from the standpoint of Before Internet (BI) and After Internet(AI) generation which roughly means those born in late 1980s (AI)and before that(BI). 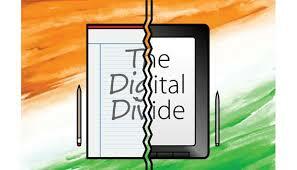 Anyone can see this digital divide within the close proximity of immediate family, friends and neighbors. The older generation, if has not kept pace with the fast changing world is saddled with writing letters, signing checks, reading the newspapers and magazines in the traditional format, standing in queues to pay their bills, buying their provisions from the market, doing high value purchases in the brand outlets and so on….In stark contrast the gen now or even those born BI, who are techno savvy, rarely ever write anything on paper unless mandatory. They use smartphones, tabs, and computers to send mails, do calculations, use latest messaging interfaces and apps, visit shopping malls for fun but order most items including clothing, groceries and even high value purchases using ecommerce sites like Flipkart, Amazon, EBay etc. They book their tickets and taxis using the apps and internet sites thereby availing discounts and working from the comfort of their homes and offices. The need to evolve thus becomes pertinent for people of BI era. They have no option but to rely on help of their children or grandchildren even for simple things like making calls or sending messages. Even the government has stopped the telegrams and postcards and letters are now on their last leg . The strange thing that I witnessed recently in a Guinness World Record show where three individuals participated using a smart phone( with auto word suggestion feature turned off), two seniors with a typewriter and a Morse Code keying device competing for sending a long message by typing on their devices. The time taken was almost the same in each case! The generation that has seen both the periods ie BI and AI are perhaps the luckiest ones. They have seen the life change literally from a bullock cart to supersonic pace in every walk of life. The medical and technological changes has improved the quality of life and increased the longevity. At the same time more challenges like pollution, immense greed, bursting traffic, new diseases have emerged. The ecological disasters are taking a heavy toll every year. It is thus important to maintain a fine balance between the nature and greed if one has to pass a legacy of inheriting a beautiful world to the next generations, and not annuling the benifits of the digital world. It is important, but not mission critical to keep up to date with technology and for me this applies for previous and current (me) generation. There is still lovely solace in writing letters by hand, and long may it continue. Receiving a letter in the post from a loved one as opposed to via email is a feeling that cannot be matched. Managing one's finances online is key and this applies to paying bills and I agree so much time can be saved. But! all this online engagement means less time for face to face interaction. Online grocery shopping is a prime example, yes we can do this online and have it delivered home at a time we choose. I have stayed away from this so far, as I like interacting, touching my food before I purchase and bumping into people for a chat. The BI generation may on one hand feel reserved about how they are falling behind in this technological shift, but I can assure they are also smiling on the inside because they are all too well aware of the limitations the AI generation are putting themselves to. Hi Rahul, sometimes it looks like the world never existed before Internet was discovered. Wherever we go people's faces are bent low over their phones, even in public places. I have seen people riding a scooter and checking their messages. I want to ask them what's the urgency? True Rachna, going overboard is definitely not required. Every invention has its boons and banes. We have lost the sense to use the technology sensibly. I have seen people struggling to have a 2 minute conversation; they have lost the skill to face-face converse! How sad can it get. I read a research paper somewhere which shows hows human face - eyes, jaw, forehead and chin will evolve in the future due to the usage of mobile phones and tablets and laptops....Sigh! I agree, we are the lucky lot. We have seen the best of both the generations. In my opinion, best thing is when BI generation learns and adapts to the goods of AI generation.